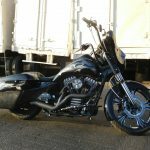 This 2005 Harley FLHT showed up at our shop after sitting outside in New Jersey for several years. 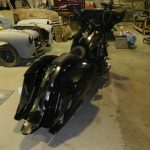 We stripped it down to the frame and clean, polish and re-coat everything. 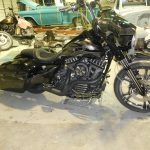 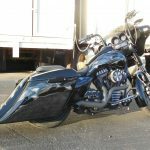 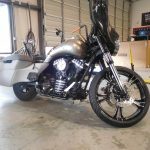 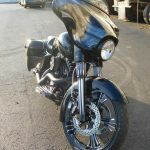 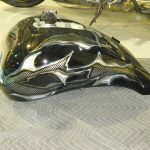 We added new Arlen Ness engine covers, fork legs and covers, and a custom seat. 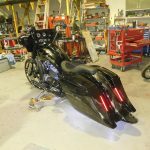 A stretched fuel tank, performance front wheel, calipers, and rotors were also added. 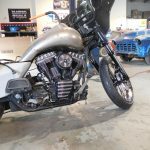 A set of 14″ ape hanger handlebars were added for comfort. 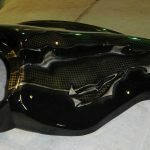 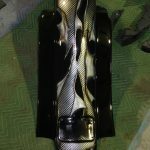 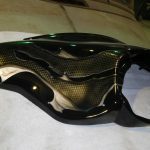 we powder coated lots of parts black and topped that off with a torn carbon fiber paint job.